Welcome to Ada's Accessories, where you can find unique ethnic attire for your little ones. Here at our shop you can find my own unique take on traditional German ware tailored to newborn through toddler aged children. 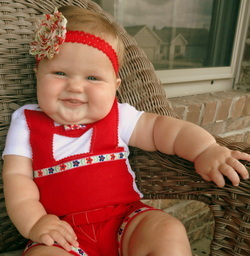 We feature handcrafted baby lederhosen bodysuits and dirndls for the littlest of babes. While we are just getting comfortable here with the middle of a hot WI summer and our Etsy shop and website may seem a little quiet, please know we are working hard on introducing some new designs for the rest of the year and getting stock ready for the upcoming German Fest season! Click the next page to learn about an exciting new announcement in the category of dirndls for growing girls that have graduated from the "onesie phase".